I didn’t know, however, that you can actually make money by submitting phrases, poems, art and photography to greeting card companies. Some even look for old photos, so you don’t have to do anything but have some fun rummaging through your photo albums and memory boxes. 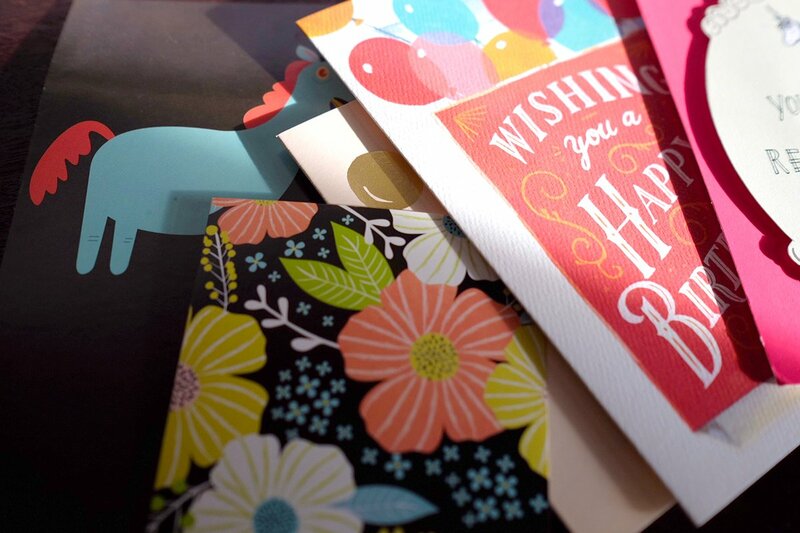 I found a bunch of greeting card companies that’ll pay to use your words, art or photos. Before swamping these companies with your submissions, though, be sure to familiarize yourself with the type of content they want. Poet-artist duo Susan Polis Schutz and Stephen Schutz founded Blue Mountain Arts more than 40 years ago. Their goal? Help people express their thoughts in, well, thoughtful ways. The poetic content is less punny and more serious. “Successful cards are warm and sincere, like a heart-to-heart conversation,” the guidelines state. Per the website, pay is $300 per poem for Blue Mountain Arts’ rights to publish it on a greeting card and other products; it’s $50 a pop for one-time use in a book. Get familiar with the content by checking out the company’s Facebook page. You can find the writing guidelines there, too. Important note: Do not reach out to Blue Mountain Arts unless you have a serious submission. “To make it, you need to truly have a passion for writing, especially about expressing feelings and writing poetry and/or prose that our buyers may find difficult to articulate,” an editor explains via email. And do not expect $300 on the spot. If your submission is accepted, which is rare for a first-time submitter, you’ll have to sign paperwork and your writing will go through tests. Then expect to be paid within 12 to 18 months. You might have seen some of Calypso’s products in speciality stores in the U.S. or Canada. The company encompasses several brands, including Selfish Kitty. If you have a cheeky, dry humorous voice, comb through the other cards — maybe even give a chuckle — because Selfish Kitty is accepting submissions for all occasions. It pays $50 for each accepted idea. Need a greeting card featuring Santa getting a back tat? Yeah, NobleWorks Cards has got you covered. Anyways, if you didn’t catch the drift, these cards are funny, unique and risqué. You can join in and submit art, cartoons or writing. Start by entering your information on its submission page. Expect to get an email outlining all of the criteria after. Pay varies, so be sure to ask. You’ve probably seen Oatmeal Studios’ cards on the shelves of popular retailers. They feature colorful cartoons with silly sayings paired with it. Take, for example, this birthday card with a cartoon of a horse reading “50 Shades of Hay.” On the inside? “It’s your birthday — Horse around!” A horse with a toothy grin holds a whip. Perfectly simple yet humorous. Think you got the right amount of sass? A bunch of submissions details are outlined on the site, although pay isn’t mentioned. If you’re an artist, find all the information you need on your page. If you’re a writer, there’s a page for you, too. You guessed it — these cards feature actual pictures, submitted by you. And you don’t even have to be good at photography. It wants your old photos — ones from the ‘40s, ‘50s, ‘60s, ‘70s or ‘80s. Photos can be black and white or color. And they’ll probably be turned into something funny, so don’t submit anything you’re super sentimentally attached to. If your photo is accepted, you’ll receive a $100 gift card to Cool Funny Gifts. If you’re not interested in a cool or funny gift, you could always try selling the card. Find all the details to submit online. These cards are hilarious. But I’ll resist giving examples to keep our site PG. If you have “funny, edgy and risque” ideas, this is your greeting card haven. But there’s a fine line. We spoke with the company’s art director who adamantly said he accepts nothing too mean-spirited, serious or religious. In addition to words, you can also consider submitting photographs and illustrations. Get the dirty details on its submission page. Payment is $50-$75 per submission. You can find all the details in the submission guidelines. Card Gnome is kind of like an Etsy for cardmakers. What you do is apply for a shop. However, that’s about it — aside from the designs of course. Other than that, Card Gnome handles the customization, purchase, printing and mailing of cards. In return, you get 5% of the price of the card (that’s a 10-cent minimum). Once you’ve accumulated $10, you’ll get a check. The Greeting Card Shop offers a similar service, though you get 24 cents for each card purchased. This is awesome if you don’t want to worry about shipping logistics, advertising or any of that business-type stuff. Your Turn: What’s your favorite one-liner?